The Student Disciplinary Procedure outlines the process of reporting any form of academic and non-academic misconduct relating to current or former students. This includes, but is not limited to, sexual harassment and misconduct. What is the balance of probabilities and why is it important? The balance of probabilities is the standard of proof normally used in civil courts and internal proceedings (i.e. an employment tribunal or a university, rather than a criminal court of law).The balance of probabilities means that decision-makers are satisfied an event occurred after considering that, on the evidence, the occurrence of the event was more likely than not. The more serious the allegation, the less likely it is that the event occurred and the evidence needs to be stronger. In the new Disciplinary Procedure, this would mean that the Investigating Officer will have to prove that it is more likely than not that a breach of the Rules of Behaviour (e.g. causing physical harm to someone) occurred before the decision-maker can impose any sanctions. 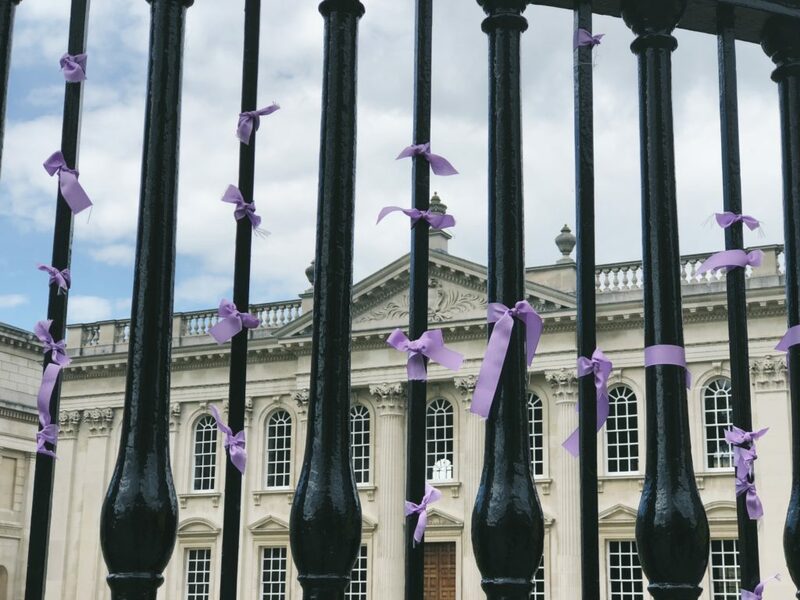 Using the balance of probabilities is considered good practice in civil cases like university disciplinary procedures because the outcomes from the case are not the same as a criminal court. For example, the university could not curtail an individual’s personal freedom like a criminal court could. For a transparent, consistent and easily understood disciplinary procedure, a single standard of proof for all cases should be adopted to ensure a fair process. The balance of probabilities is the only standard that can be adopted because the Office of the Independent Adjudicator (the OIA) requires the balance of probabilities to be used for students who are subject to fitness to practice proceedings. This includes medical students, veterinary student and PGCE students. Why do I need to email OSCCA? Although the revised Student Disciplinary Policy and Procedure contains vital changes that have been called for from the student body and the university’s Review Committee, we must have evidence for the support among the student body for the Procedure to pass through the various decision-making bodies that will review it in order for it to be implemented as the new Procedure in October 2019. There will also be a vocal few who oppose the changes. We must not let these responses skew the feedback in favour of an unrepresentative opinion. 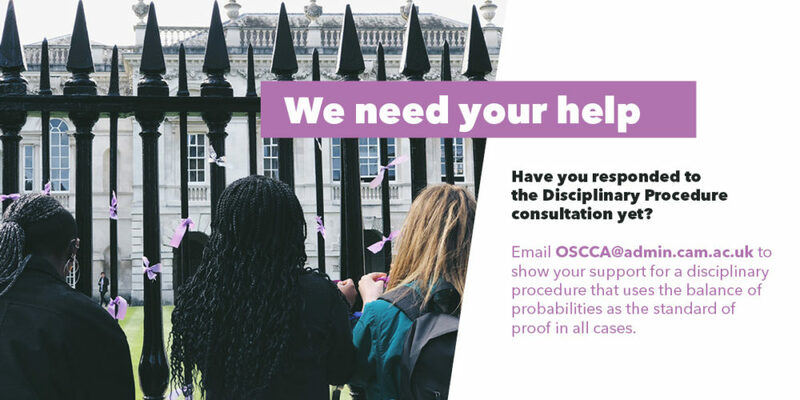 Last year, OSCCA counted up the responses to the first consultation that were for and against changing the standard of proof, and it is likely for this to happen again, so the amount of replies we send in favour of the balance of probabilities is important. The most important thing to get across is your support for changing to the balance of probabilities in all disciplinary cases. This is an initial list. The most significant changes are outlined in the 6-page consultation paper from OSCCA, and the entire Procedure is a 20-page document. All documents, including the guidance on potential sanctions following a disciplinary case, can be found at the OSCCA website. The Women’s Campaign will be compiling example responses and further explainers on why these changes are significant during the month of February. How should I start my email? “Dear OSCCA, I would like to support the change of the standard of proof used by the University to the balance of probabilities…” and signed off in any manner, e.g. best wishes, many thanks, regard, etc. Emails can be any length from “Dear OSCCA, I support the change to the balance of probabilities as the standard of proof in all disciplinary cases as part of the new Student Disciplinary Procedure” to more substantive responses that give reasons for your support, include personal testimonial if you so wish, and outline any parts of the Disciplinary Procedure that you want to comment on. Reponses to last year’s consultation from the Womcam committee ranged from a couple sentences to multiple pages in length. There was also a range in tone as well as the amount of content and depth in which individual responses were substantiated. This range came from the amount of time and energy the person emailing had at that time. The most important thing is to show your support for the proposed changes such as the balance of probabilities or the full-time Investigator role. Can I fill it in on behalf of a group as well as myself? Yes! Ensure that you email OSCCA@admin.cam.ac.uk as yourself, including any relevant positions in your sign-off, and you can also send an email from a group that you are a part of – making sure that you have written the email together and gotten a group consensus that you are happy to respond as a group. This could be a student campaign, a feminist society, a sports team or any other society/group in the university. The consultation is open for the entire month of February. Email OSCCA at OSCCA@admin.cam.ac.uk with your responses by midnight on the 28th February 2019.